The National Weather Service have undertaken an experiment to search for Twitter messages that contain significant weather information. Geotagged tweets allow the NWS to correlate each Tweet to its location and determine when it was sent. 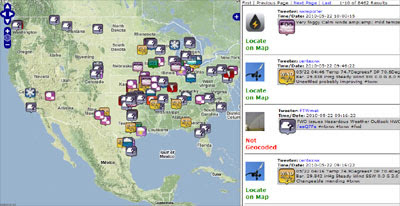 This capability they hope will help to enhance and increase timely and accurate online weather reporting. This Google Map displays Tweets that mention #wxreport, #[state abbreviation]wx or a number of other weather related hashtags. Do you know of any websites that are plotting these tweets on Google Earth? ?